I will be adding resources here as I find them – mostly Maths and Physics themed. Loughborough’s Mathematics Education Centre runs a free, three-week MOOC – Getting a Grip on Mathematical Symbolism – designed for those students aspiring to become scientists or engineers but who lack mathematical confidence. The course is designed for students who have some engineering or science knowledge gained through vocational qualifications or through workplace experience but who perhaps have not studied mathematics formally since leaving school. It will be appropriate for those who lack confidence but who need to establish a bedrock of knowledge in order to further their education. This is a foundation, entry-level course and is not intended for those who already possess recent post-GCSE mathematics qualifications. It is highly recommended for those students going to university who have not studied maths beyond GCSE. Please share when appropriate. Note that it is planned to run this course again shortly before the start of the new academic year in September. Magnet Academy is an online resource provided by the National High Magnetic Field Laboratory — the largest, most high-powered magnet lab in the world. It has a wide selection of useful tutorials about electromagnetism for ages 5 upwards. This entry was posted in Magnetism, Outreach, Physics, Uncategorized and tagged electricity, force, magnetism, magnets, maths, mooc, Outreach, Physics, science, tutorials on February 21, 2017 by kmorrison2013. If you’ve ever had a chance to play with ferrofluid then you’ll be familiar with the typical picture of a ‘flower-like’ pattern. A ferrofluid is a suspension of tiny magnetic (iron) particles, covered in a substance called a surfactant (e.g. oleic or citric acid) that is mixed with oil. 1) The iron particles are attracted to the magnet. 2) The surfactant binds the iron particles and oil limiting how far the iron particles are pulled towards the magnet thus leaving it slightly mobile. 3) A combination of the magnetic field and surface tension of the ferrofluid mixture results in patterns that follow the direction of magnetic field lines. There are several videos online (YouTube is a big culprit here) that suggest otherwise but I can only assume that they switch to storebought ferrofluid when they start the demonstrations. If anyone disagrees with this send me your recipe! I’d be happy to be proven wrong. 2) One of the YouTube videos above also suggests that you can mix the ferrofluid with water to create a more fluid mix. Again, this is pure myth. For a short term solution you could mix it with a water:propanol solution but this will slowly breakdown the ferrofluid itself and likely would not last more than a few weeks. If you want something more long term then you may need to buy it from a specialised company. *Non-technical description of a surfactant: A chemical with ‘arms’ that can grab onto other substances. 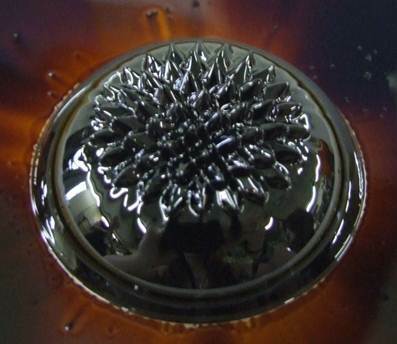 This entry was posted in Magnetism, Outreach, Quirks and tagged ferrofluid, magnetism, magnets, myth, Physics, surfactant, YouTube on September 26, 2013 by kmorrison2013.